Beautiful, spacious, acoustic piano and cello music. A journey through 2 waves of energy. Suitable for dancing, meditating, massage and moments in time and space. Tracks: 1 First Light, 2 Valour, 3 Delirium, 4 Twilight 5 Vigil, 6 Dark Earth, 7 Arising, 8 Eerie Elves, 9 Eerie Cellos, 10 Homecoming, 11 Still Dancing. "I am deeply moved by "Still Waves". It is chamber music to ignite the Spirit." Marius-Christian Burcea, host and producer of radio show in Bucharest, Rumania. ìThank you, oh thank you. I have danced and danced and danced to your amazing music. If you had made it just for me it could not be more perfect. Itís beautiful, it breaks me open. This is love-in-action.î Sue Rickards 5 Rhythms teacher, London. This music was originally made for, and inspired by, Gabrielle Rothís 5 Rhythms, a movement meditation practice at the interface between artistic expression, healing, and spiritual practice. This album has been made as a journey through all the 5 Rhythms (Flowing, Staccato, Chaos, Lyrical, and Stillness) within the context of the Rhythm of Stillness. Julian Marshall has been a wonderful musical accomplice and inspiration for many years. Heís played at dance workshops, played on my other albums, and been my GCSE music teacher. The inspiration for this album came when we did a benefit movement meditation workshop together for a local school. 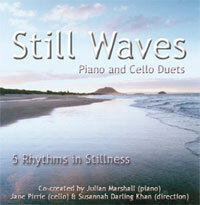 Our intent was to create music to support the dance of the 5 Rhythms within the vibe of Stillness. We were, even more than usual, looking for the space between the notes. We were charmed, surprised and excited by the music that evolved through this; solo piano music for dancing in dynamic stillness. We decided to record, and to make another offering into the rich and wonderful pot of music in the world. We laid down the piano tracks in Julianís office with his lovely upright, accompanied by cats, cars and gurgling water pipes. Every now and again there is an odd click or tap, proof of this albumís real ëhome madeí beginnings.